Greensmith Energy, a Rockville, Maryland-based provider of software and integration services for stationary energy storage systems, announced in August that AltaGas has selected it to be the software provider and system integrator for a 20 MW/80MWh system in Pomona, California. Greensmith also announced that it has partnered with E.ON Climate and Renewables and Tucson Electric Power for a 10 MW energy storage project. Greensmith will design and deliver a grid-scale energy storage system at the University of Arizona Science and Technology Park. The company also entered into a corporate partnership with Wärtsilä in Finland. The company announced earlier this year that it had been awarded a total of 63 megawatts in new orders in 2016 and is on track to install over 100 MW of energy storage by the end of the year. Greensmith says its software is the most widely deployed energy storage management software. 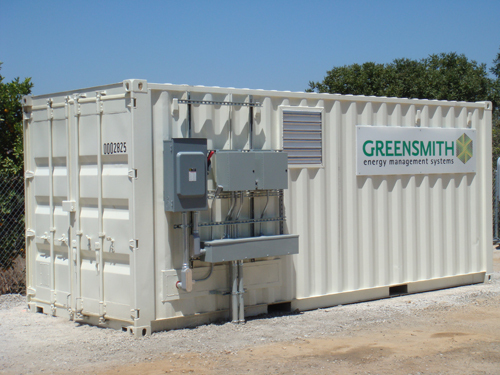 In addition to its utility grid scale energy storage projects, Greensmith launched a behind-the-meter energy storage product for corporate and industrial users in July. Greensmith, founded in 2008, completed an $18.3 million Series C venture capital funding in December 2015, anchored by strategic investors E.ON and American Electric Power. Its fourth generation software platform, GEMS, is used for voltage and frequency regulation, peak shaving, PV smoothing, microgrids, and back-up power for critical loads. Its platform incorporates lithium ion batteries from Aquion Energy and zinc-iron flow battery batteries from startup ViZn Systems. Aquion Energy raised $33 million in venture capital funding in April and has raised a total of $162 million in funding from investors including Bill Gates, Gentry Venture Partners, Kleiner Perkins Caufield & Byers, Foundation Capital, Bright Capital, Advanced Technology Ventures, Trinity Capital Investment and CapX Partners, Yung’s Enterprise, and Nick and Joby Pritzker. ViZn Systems raised $10 million in Series E venture funding in April. In 2015, Greensmith was named the Washington Business Journal’s fastest growing company of the year, with revenue climbing from $2 million in 2012 to $16.7 million in 2014. Other accolades include being ranked number two among energy tech companies on Deloitte’s Technology Fast 500 and being named a 2015 Bloomberg New Energy Pioneer.